My thoughts on MNPPC county-wide, comprehensive natural surface trail closures. As many of you are aware the MNPPC has issued a closure of all natural surface trails in Montgomery County until further notice. The blanket county-wide trail closures we are experiencing are a policy that I have personally only seen instituted this year, specifically, this summer. I have to believe, and I have nothing but a gut instinct here, that this is due to the exponential and expanding increase in trail use by mountain bikes (I know, here comes the darts). I have no intent disparage the MB community because many trail runners participate in this activity as well and they have every right to use county resources. In addition the MB organizations do A LOT of volunteering and do a lot to maintain the trail system. In fact, many MB groups issue voluntary notices asking riders to keep off of muddy, wet trails because of the potential damage that bikes can cause. 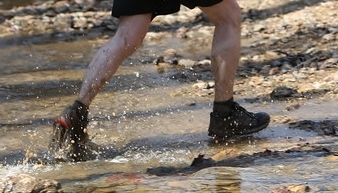 However, pound-per-pound it is hard to dispute that a human on a bike has a greater impact on a trail than a human on foot. If the county has concerns about ‘trail integrity’ as mentioned in their announcement, they should look at graduated closures (i.e. trails closed to certain set of users based on trail conditions) or closing certain compromised sections of trail rather than a comprehensive closure thus denying access to ALL users. There are just as many, if not more, trails that drain well and are not in low-lying, flood-prone areas as there are trails that do get rendered impassable by flooding or standing water. I observed trails last night that would have supported use by all groups (mountain bikes included) with little to no adverse impact. The county, in their announcement, cites two reasons to keep people off natural surface trails after excessive rainfall: First is safety. This is baseless unless you close ALL parks and paved bike paths as well. There are no areas that pose more danger because it is natural surface vice paved due to excessive rainfall. One only had to look at the conditions of the Parks Half Marathon Course this past weekend to see that. I have never seen the Parks Dept. close an entire trail system for heavy snowfall, ice storms or excessive wind which pose more of a threat to personal safety than water. Second, trail use can “adversely affect the integrity of the trails.” The MoCo trail community has been using the trail system for decades, in all conditions, with minimal impact (races being an exception) to the trails or runner safety from excessive rainfall. This has never before been a concern in the 20+ years I have been running on MoCo trails. For some reason it is now an issue. Our running groups are not large and there has never been any overt ‘damage ‘ to the integrity of the trails we run on and no one has ever had their safety compromised by using the trails. In case you haven’t picked up on it yet this issue touches a nerve for me but this is my take on it. My opinion , not that of tne Muddy Shoes group. I would be interested to know the county’s reasoning behind their decision. OK, I’m ready for the backlash.